If your experience with light bulbs starts and stops with replacing the light bulbs on your floor lamps, you might be surprised by the number of styles of light bulbs and the mounts they attach to. Each of these styles has an acronym, which makes things no easier for the beginner, especially considering each bulb style has its own name as well as each base. Halogen bulbs are often used in stage and outdoor lighting. PAR stands for Parabolized Aluminum Reflector, which refers to the reflective material contained inside the bulb. Shaped in a gentle arc, or parabola, with the bulb at the base, a coating of aluminum reflects the light made from a PAR light's halogen bulb. 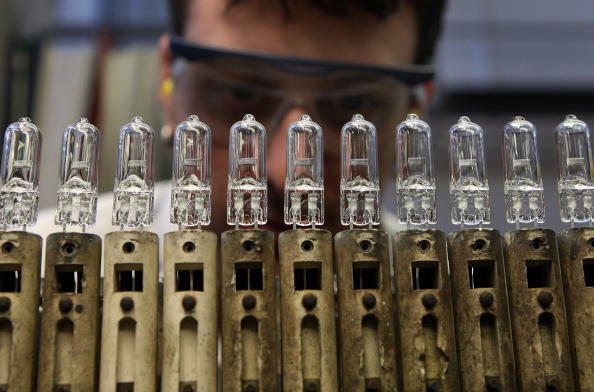 The bulbs are also given numbers, each of which stands for an 1/8-inch diameter. This means PAR20 bulbs measure 2 1/2 inches across the face. PAR bulbs, though powered by halogen lights, use the E26 or E27 screw mount. This familiar mount is the normal medium screw base found in nearly every indoor lamp in America, with the E standing for Edison. GU10 is a bayonet mount base style commonly used on MR (metal reflector) style bulbs. With the GU10 bayonet mount, these bulbs have a pin on their base that fits into an L-shaped track on the fixture, requiring you to lock the bulb in place with a one-quarter turn. The GU10 is most often attached to MR16 bulbs, which is another variety of halogen bulb using a different style of reflector. One is a bulb and the other is a mount so comparing the GU10 mount to the PAR20 is really impossible. The mounts of the two bulbs do not differ appreciably in function, either, though they are obviously not compatible with one another.